Sorry I've been quiet this week. I came back from Orlando, and have been working hard on getting the website live. 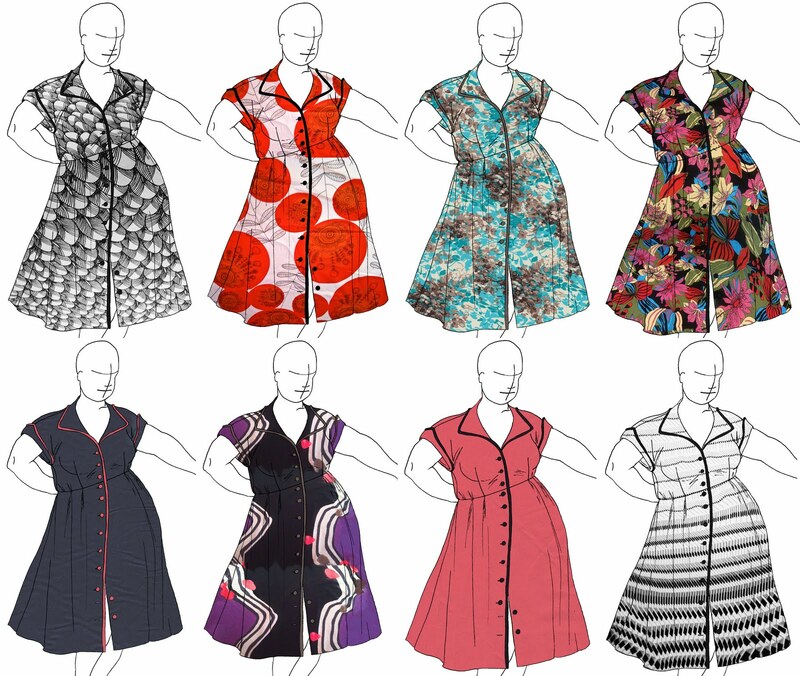 Let's just say that coding HTML is not my greatest gift... plus size clothing, no problem! Lest you think I've forgotten you, I have a new style to show off. The ANNA is a button down shirtdress with turned up cuffs and contrast cord-edge trimming. It's got a more traditional waistline with fullness controlled by inverted pleats on the waist and darts. It also has side seam set pockets and...drumroll please... horizontal buttonholes and a hook at the waist! You know when you wear a button front, well, anything, and the minute you sit down or reach wide or, well, move, you've popped your buttons open? Or the straining ones at bust and belly? Simple solution: With about .375" of movement built into the buttonhole slot, you're pulling at the reinforced hole END, not the floppy slotty bit in the middle. And that extra tab with a hook and bar at the waist that no one ever sees? Handles the point of closure that receives the most force trying to pull it apart. Hooray! Plus the piping is jaunty, don't you think? As always, comments and opinions are welcome. Tell me your favorites and which are just okay. Tell me the one you want to wear every day. Tell me if you like it more or less than the AIMEE and SOFIA (previous blog posts). Just tell me! I have that very same button issue. 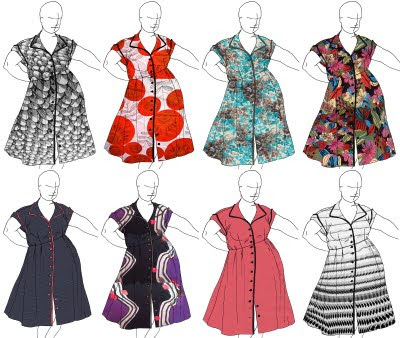 And I particularly like that dress on the lower left- there's just something about the red piping that speaks to me! Thanks @childofmetis! In a bigger version of this drawing, you can see easily that the dress is dark navy blue cotton sateen, and the trim is actually a beautiful salmon/coral cotton sateen. Hopefully that works for you even more!